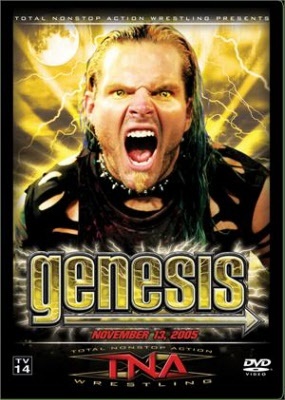 epic event “Genesis” ive and exclusively on Pay-Per-View. as he became the biggest acquisition in the history of TNA Wrestling. in a chaotic and bloody main event! X DIVISION CHAMPIONSHIP MATCH:“The Phenomenal” AJ Styles vs.
NO DISQUALIFICATION MATCH:“The Homicidal, Genocidal, Suicidal” Sabu vs.
CONTENDER’S MATCH:“The Charismatic Enigma” Jeff Hardy vs.
HOCKEY STREET FIGHT MATCH:The 3Live Kru vs.
Plus, exclusive backstage footage of your favorite TNA stars!